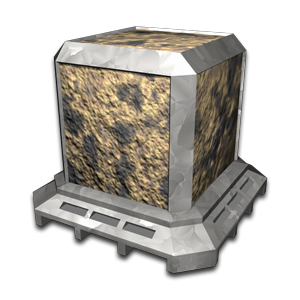 Processed ore is created by refining raw ore into a more pure and consistent form. In this form, it becomes significantly more valuable as both a primitive building material, and more importantly, as a resource that can be further refined into steel. Steel is a far more valuable and necessary material, as it can be used in the production of starships and weapon systems. The steps by which raw ore is processed are simple and cost effective. The final product ends up being a more uniform density and a sturdier product. While not entirely pure like steel, processed ore still contains trace elements of other minerals and soil.